People who piece together and sew the quilts that we give to everyone who is baptized at Mt. Olive (and the quilts are also distributed to many others). The Olive Patchers meet every Wednesday at 10:00 AM. 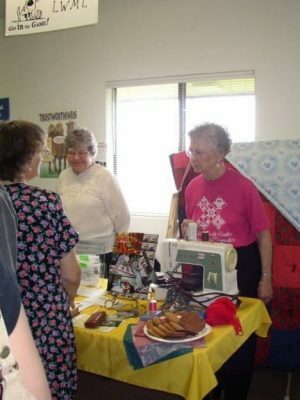 Quilters gather each Wednesday at 10:00 AM at Mt. Olive to create these beautiful, hand crafted quilts which then are given away, destined to touch and warm many people. 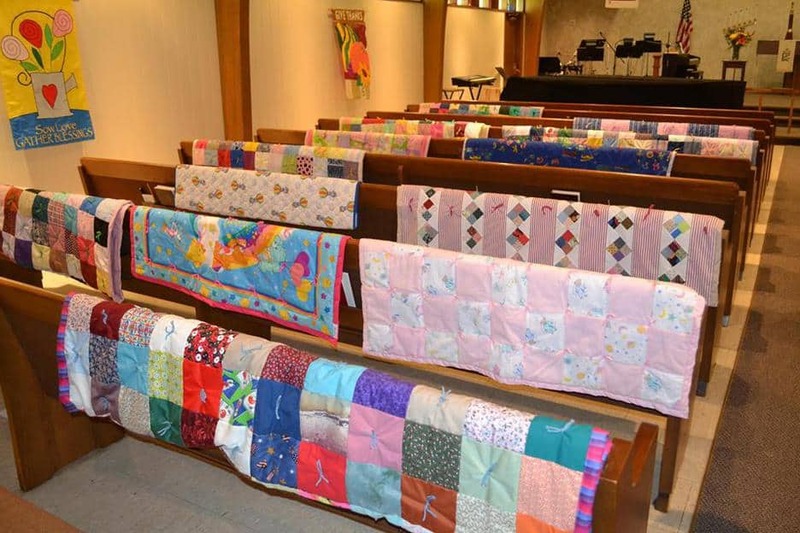 Before we spread the quilts out on the pews for blessing on a Sunday and then give them away, all of our quilts are identified with a small “Mt. 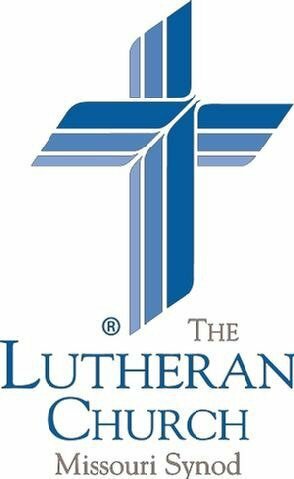 Olive Lutheran Church” label sewn onto the hem. Red, white and blue quilt with a patriotic theme is popular gift for veterans. The need for these warm blankets far exceeds what we quilters can supply so we could really use some additional hands to help! We never have enough quilts to keep up with demand. Everyone is welcome to join us to help make these lovely quilts! 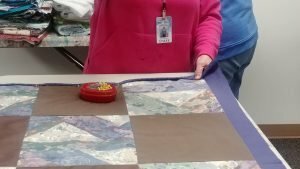 Come on Wednesday one week or every week, you can always find ways to help in our simple quilting process. You don’t need to know anything. We will teach you everything. People sometimes relate touching stories about the quilts that are given away to bless people in many different places. Most of the time we are not even aware of where the quilts may end up, but we know that they provide comforting warmth and give people joy. Folding and pinning the hem. In 2004 several members of Mt. 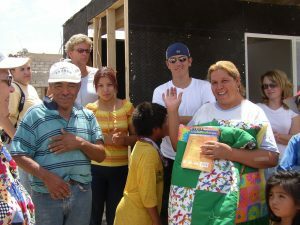 Olive Lutheran Church (together with several people from a Puget Sound church) went on a week-long mission trip to Anapra, a poor part of Ciudad Juarez, in Mexico. 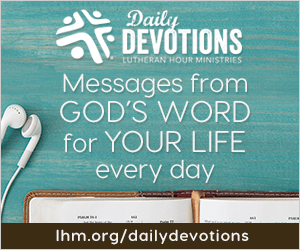 This family holds new bible and a quilt from Mt. Olive in front of their new house. The families whose homes they helped build or repair were also given quilts from the Mt. Olive quilters. 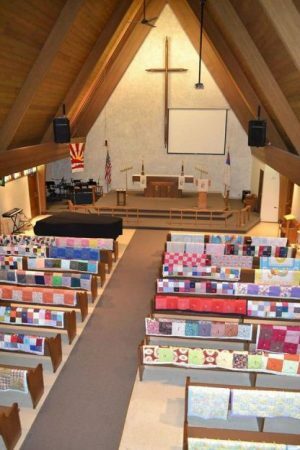 Quilts are laid out on the pews in the Mt. Olive Sanctuary for blessing during a Sunday worship service. Then the quilts are given away all over the world. 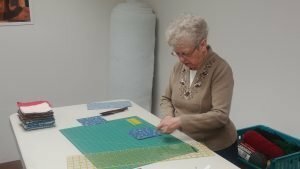 In making quilts for non-profit organizations in Yakima and across the world, we use up a lot of the material needed for the back of the quilts. For this purpose, fabric that is a cotton blend or flannel is preferred. Your old SHEETS (any size) are perfect for the job!!! Solid colored sheets or patriotic colors are most needed right now. 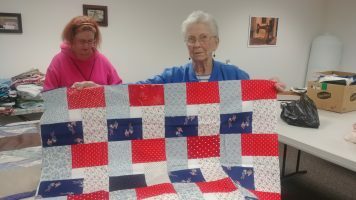 The hospice “Cottage in the Meadow” has asked us to make more quilts for veterans with red, white and blue colors. We also are in need of various blue colors of yarn for tying each piece. Please remember us if you have old sheets that you are no longer using. If you put on a yard sale, please don’t sell your extra sheets or fabric that we could turn into much needed quilts. In addition, we always need thread and we always welcome fabric donations as well. We will gladly and gratefully accept your donation.